Picture 1. Typical Budget Whole House System with two 'Big Blue' cartridges. Choosing a Home Water Filter requires some basic knowledge about your water source, and some planning for the type of system and contaminants that you want to remove. First, start by measuring water line diameter at the entrance into the house, anywhere where it is exposed and before it connects to the water heater. For apartments, it may be also before a water heater, or somewhere where it enters the premises, such as a closet, a laundry room or kitchen area. Typical apartment and small home water line size is 3/4". Large homes may have 1" - 1 1/4" lines, and commercial building can have lines 1.5" in diameter or more. Measuring a water line size gives you an idea how much water can potentially be used per minute or per hour. Picture 2. Typical Large Whole House System with Two Tanks and a Softener. Whole House Water Systems can be designed to address most of these problems. Several different types of systems exist. Budget Systems usually consist of one or more filter housings (see Picture 1 above) that are either connected in a row or located separately. Housings hold replaceable filters. Water will flow through each housing and each filter, in and out. Contaminants are usually removed by the material inside the filters. Large Systems may consist of one or several TANKS that hold water purification media. Usually this means a water source is of poor quality, has many different contaminants, or it may be an untreated source such as a well. 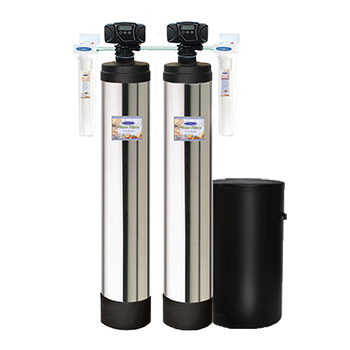 One more system stands out from other Whole Home Water Purification Systems. It is Reverse Osmosis. New technology uses thin film membranes to basically split water into two streams: one near pure and one with contaminants. The contaminated feed then is typically discarded, while near pure water is further processed in order to be fed into a home plumbing system. 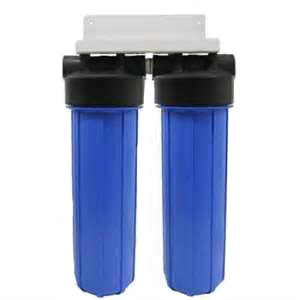 Read more about Whole House Reverse Osmosis Systems.